It is not easy for a human to traverse the deep, cold waters of Antarctica. It is easy, however, for seals to swim through them. For the past decade, scientists have been turning elephant seals into live, swimming sensors to monitor those waters. Now, the data’s going public. The Marine Mammals Exploring the Oceans Pole to Pole consortium (MEOP) has just opened a new portal with all that data, along with 77 research papers based on the fruits of those labors. Together, they’re a snapshot of the world’s most remote oceans, as told by sensors attached to the heads of seals. So, these sensors—they’re not the sexiest even by our current wearables standards. They weigh a pound each. 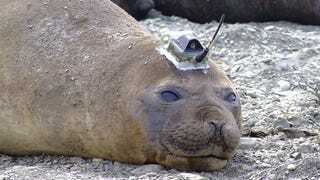 Scientists catch seals and immobilize them, sticking the sensor in place with glue. The rugged sensors are powered by batteries, and they beam temperature and salinity measurements up to satellites in space. They last for up to a year, when the seals shed them during their annual molt. Since 2004, seals and other marine animals have gathered 400,000 environmental profiles for MEOP, each of them representing one dive. They dive as deep as 7,000 feet. “They are taking data from places where there has been virtually no data before. It’s unique,” Mike Fedak, a scientist who worked on the project, told AFP. It’s a boon for science. No word, however, on how much the seals like their head accessories.